We have good feelings about 2016. The year has yet to begin, and we’re already excited about the possibilities of what fun things we’ll get our hands into. I’m big into goal-setting, and what better way to start the year off then by setting some goals. We’ve been experimenting with design and products for our soon-to-be unveiled Etsy shop. We’ve set a date, and we’ll officially open our online doors mid-January. Design one-of-a kind laser cut and engraved items for our shop and also for you. 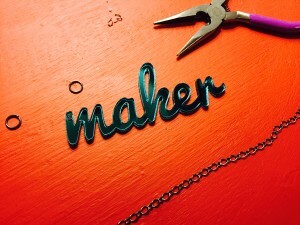 Let us know if you’d like to chat about unique laser inspired design, email us at makesanantonio@gmail.com. We’d love to create something amazing for you! Remember that vintage sewing machine we acquired? It not only looks awesome, but it works. I hope to get some weekend sewing tutorials from my Mom (who is a seasoned seamstress, and has made plenty of curtains, halloween costumes and even a very retro prom dress, but more on that later), and hopefully learn how to sew this year. We’re working on a few fun family-friendly workshops throughout San Antonio that we’ll be able to formally announce in February. Be sure to check-in for updates! Continue to make our presence known in the community. We’re participating in a local elementary school’s STEM Night, and we’re already slated to participate in a summer event at the Briscoe Western Art Museum. We have so many ideas, and we feel like we’re just scratching the surface on what we’re all about. In 2016, get to know us better. Visit with us, and let us know what you’d like to see in our maker community. We’ll do our best to make it happen. Let’s see what we can make together in 2016! Let’s get a Makerspace/Hackerspace in San Antonio! Yes! It’s on our calendar to apply/participate. We’ll be there! Happy New Years, Linda. See you soon. Don’t forget our Wilson County Mini Maker Faire in September. We definitely want you to come back as an exhibitor!